Well there is, its called a Garrett pro pointer. Once you have used a Garrett pro pointer you will wonder why the hell you never owned one sooner. There are many different pro pointers available from different manufacture's however a lot of them are a waste of money. There is no point in having a pro pointer that you need to touch the actual find with, as quite often the find is located in the side wall of the hole or deeper in the hole. The Garrett pro pointer can detect metal objects from around two inches away or greater if the object is a little larger. It runs on a single 9v battery, which you will find will last for many hours, in fact I don't think I have changed mine in two years. 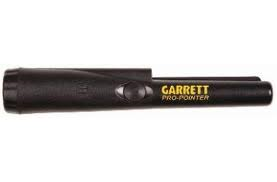 The Garrett pro pointer has a vibrate function and also audio function. The audio function works by making a broken tone that as you get closer to the find it turns into a constant tone which lets you know you are pretty much touching your find. It also has a nifty little led flashlight which shines light into the hole so you can see its reflection on shiny metallic finds. As for the Garrett pro pointers reliability, it is great and I have had no problems with it throughout my ownership. It does get quite a bit of stick really as I always end up using it to scratch around in the hole if the find is still buried a little deeper. But the hard plastic it is made of is really up to the job, it actually has a scraping blade along the tip to use for scratching around in the hole. As I said before there are many pro pointers available on the market at various prices but the Garrett pro pointer is by far the most popular and this is due to all the factors mentioned above. I would be lost without mine now a days and struggle to remember how I coped before I purchased it.